Relaxing and fun — aren’t words that typically go together, but that’s how we describe our experience with the Kauai Backcountry tubing adventure. The adventure starts in Lihue where you meet the fun guides and get your gear consisting of a helmet with a headlight and gloves. An informative and sometimes bumpy 30 to 45-minute van ride leads to a nice view of the oft cloud-covered Mount Wai’ala’ale — the water source for our tubing ride. You get to hop out of the van to take in the view. Then it’s back in the van for a short ride to the start of our floating adventure. The guides carefully assist each person as they plop into their tube. Overall, the guides did a great job keeping us together and safe all while having fun. They all had a great sense of humor. Unlike typical mountain tubing adventures, the water source isn’t a river — it’s an irrigation ditch. This ditch was originally hand dug in the late 1800’s to water the booming sugar plantations. 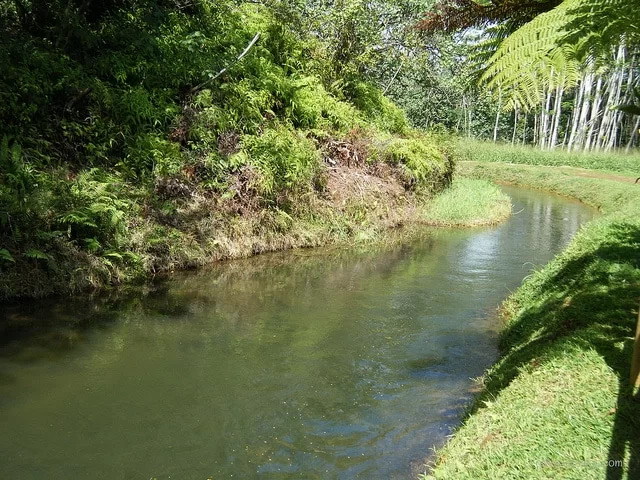 Now that the plantations have all gone, the flow is used for Kauai’s drinking water. The ditch flows through a green forest with some tunnels. The water moved fast enough to have fun, but slow enough to enjoy the green canopy of ferns and trees in between tunnels. I believe we traveled approximately three or four miles of the irrigation ditch, though in total, it’s much longer than that. After our float, we boarded the van for a short ride to a picnic spot for lunch and a swim. Lunch consisted of a make-your-own turkey sandwich, chips and a cookie. We had the option to swim again, but no one in our group did that. From there, we boarded the van to go back to the Lihue office where we started. Our video will give you a better idea of the pace of the water and the scenery. – Pricing is $102 plus tax per person. We recommend that you check around for pricing. 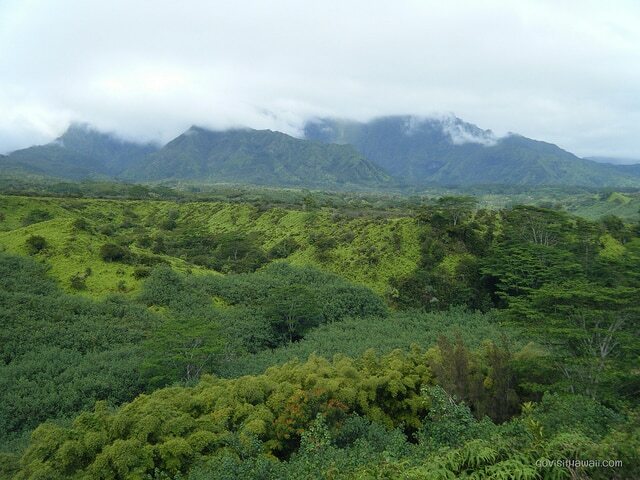 We were able to save 13% by booking through a Hawaii tours discount broker. If you enjoy the help that the guides provide, bring along some cash for gratuity. – You must be age five or older, 43 inches or taller and weigh less than 300 lbs for this adventure. – Don’t be surprised that you must weigh before heading out on the adventure. The weight is needed for the guides to choose the proper size tube for you. – Bring/wear sunscreen and bug repellant. – Wear swimwear and/or quick dry clothes. Ideally it’s best to wear a long-sleeved rash guard to prevent skin burns from skin catching on the tubes. – Wear shoes that are designed to get wet like these. If you don’t have water shoes, the company rents reef shoes. I wouldn’t recommend wearing flip flops as you feet might scrape against the tunnel wall. – There’s no need to bring a hat or visor as you’ll be wearing a helmet. – You pre-order your lunch when you book. You have a choice of turkey sandwich or veggie sandwich. I ordered the veggie sandwich, but somehow my order didn’t make it. – I recommend the late morning 10am start time so that the provided picnic lunch will best coincide with lunch time. Do you need to know how to swim to do this? To my knowledge, no. 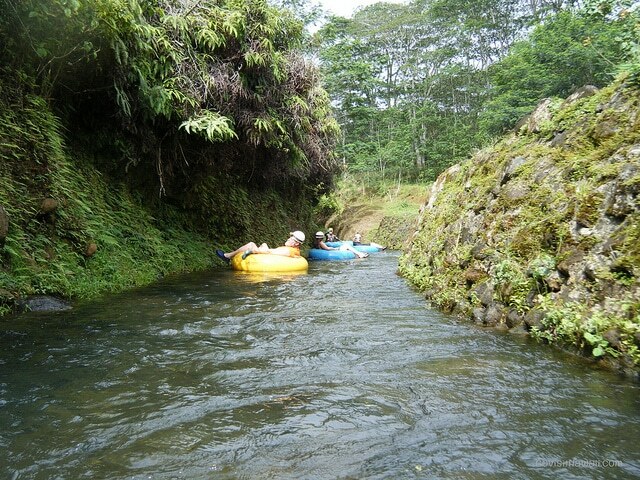 I recommend you verify that directly with Kauai Backcountry Tubing. I think it would be highly unlikely for someone to fall off the intertube unless they were specifically trying to do so.